At around $5 a pound, the bottom round roast makes for an economical (and flavorful) cut. 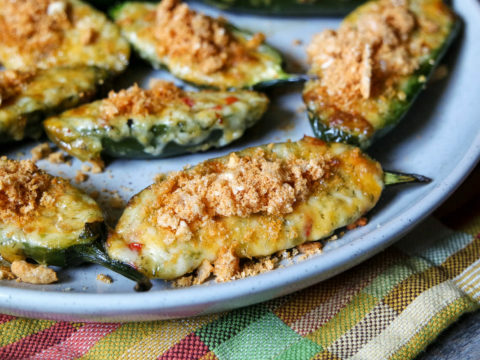 Try it with this roast Hatch chile crust! A very talented butcher friend of mine, Jered Standing, recently posted a picture of some pretty Top Round steaks, and remarking that the United States seems to overvalue tenderness. See, generally if a steak is naturally tender, it tends to have less beefy flavor. And conversely, there are some almightily flavorsome cuts that do require a little bit of chewing. I can’t say I disagree with him. Most meat fanatics I know will rarely order tenderloin, because it’s generally considered one of the least flavorful cuts on the entire steer. We also tend to focus a lot on cuts that come from the forequarter, areas like brisket or chuck that magically transform to gelatin-rich tender goodness when enough heat and time are applied. But if you want real value for money, the hindquarter has the goods. It’s home to a variety of whole muscles that are perfect for braising, jerky, pot roasts and of course, classic roast beef. Besides, you can really offset most tenderness issues by simply slicing the meat thinly. I used a Bottom Round Rump roast for this recipe, and it cooked to a perfectly pink medium in the Pit Barrel Cooker. Not quite a drum smoker, the Pit Barrel is unique because the food hangs from hooks above a charcoal basket, so any dripping juices hit the hot coals, creating steam which helps to keep moisture in the cooking chamber. All up, it was a “set and forget” cook, that took around an hour and a half. Light the coals, put the roast in, and then keep and eye on the internal temperature of the meat after about 90 minutes of cooking. Easy! The cooking process slowly roasts the fragrant Hatch peppers to give a zesty fresh finish with the perfect amount of heat. If you’re looking for other recipes using Hatch chiles, check out this Hatch & hominy skillet bake. If you don't use a Pit Barrel, you can recreate this recipe in the oven, cooking on a rack placed into a roasting pan at 275f. Light a full charcoal basket for the Pit Barrel cooker and allow the unit to warm up. Trim the roast of any silver skin along the underside. In a bowl, combine both mustards, Worcestershire, paprika, pepper, onion powder and Hatch chiles. Stir with a spatula to combine well. Sprinkle the roast liberally with salt, then apply the Hatch paste with the spatula, making sure the entire surface is well coated. Thread two hooks through the thicker end of the meat, and hang in the cooker for around 1.5 hours, until the internal temperature reaches 140f. Remove from barrel, remove hooks and allow to rest under foil at least 15 minutes. Cut the roast no thicker than 1/4 inch per slice, and serve.